Day 8 – It’s been just over a week now that I’ve been sitting here in this tree in an area we have come to call “Julia’s Forest.” The most incredible part of the experience has been the messages and phone calls that have been bursting with inspiration, enthusiasm and passion. This has been so uplifting, especially those messages from people who have worked tirelessly for so long to protect the forest, many of whom have become weary and disheartened by the roller coaster ride of fresh hopes followed by broken promises. It all started getting close to two years ago now. The forest industry was in crisis. The international market was becoming less tolerant of paper and wood products coming from Tasmania’s old growth. This was one factor in a range of forces that lead to the industry coming to the table to be a part of the “forest peace talks” as they were to become known as. Industry bodies, union reps and greenies were sitting down together talking. As strange as it seemed, it made sense. Because really we have more in common than maybe we realise. What environmentalists want is what most people want, after all, right? A future. A future with clean air and clean water and a climate that we can survive in. And what forest industry workers want is a future too. I can’t claim to know what other people really want, but I imagine that it’s something along the lines of a future where there is work for themselves and for the next generation. These things don’t have to be incompatible. And it seemed like a whole new realisation was being made along those lines. Everybody’s future depended on a change in the industry, shifting out of native forest destruction. 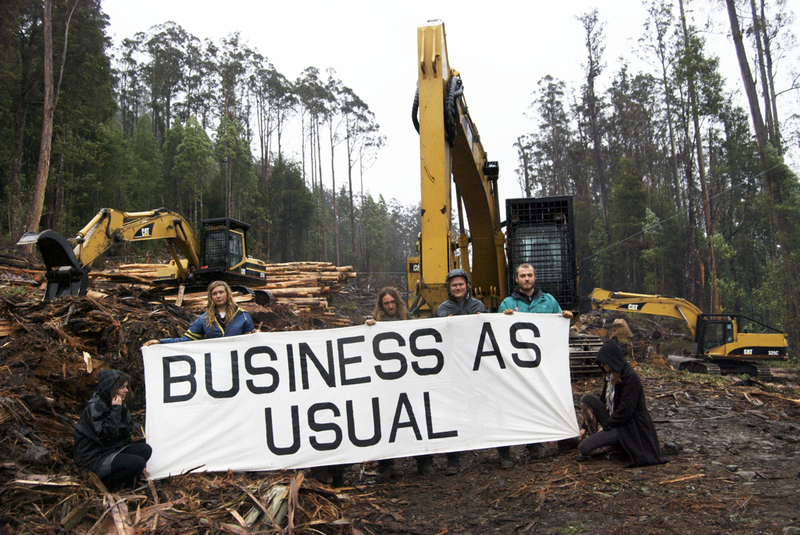 Then the announcement came that Gunns Ltd, the biggest woodchipper in Tassie, was exiting from native forest logging. Tasmania’s forests were still being decimated at the same rate as ever, but now the end seemed in sight. So we waited. Finally, October 2010: The Statement of Principles was announced, which included a moratorium on 572,000 hectares. Within 90 days logging would cease in that area for the duration of the verification process, which would lead to formal protection. Time to celebrate! I imagined the day when we would soon be packing up Camp Floz- no longer needing to blockade to defend the Upper Florentine Valley. Every one was talking about the good news!! Yet, something wasn’t quite right. The machines were still in the forest. And not only were they not moving from areas they were in – they were starting new ones, and to top it all off, they were building more roads! New logging roads being built into areas that weren’t going to be logged? No, something just didn’t seem to add up. Ok, so good to clear that up. Now we just had to wait for the pollies to get their act together. Dec 14th 2010: Tasmanian Premier David Bartlett announces their support for the Statement of Principles, in full, including the Moratorium to be implemented within 90 days. This gave Forestry Tasmania plenty of time to get organised and reschedule out of logging coupes, shifting workers located to other sites. But Forestry Tasmania just didn’t seem to be moving – there was no progress being made. The deadline for the moratorium, March 15th, loomed ever closer. Was FT going to suddenly be able to reschedule all those coupes at the last minute? Why weren’t they moving any contractors out by now? All these questions began to arise and no one could give a straight answer. Still Wild Still Threatened worked on documenting the coupes within the 572,000 in our local area (the Derwent region). We assessed which coupes were being logged and also surveyed those areas that were left for their conservation value. I spend a lot of time in amazing areas of old growth that we have left, see, these are the places I spend most of my time. And so, in a way, I guess I’d almost come to take it for granted. This documentation process really brought it home to me how rare and precious those areas are how quickly they are disappearing. Most places we surveyed were being logged. March 15th 2011: The day came and went… The bulldozers and chainsaws ceaselessly continued. Hectares upon hectares of forest that was meant to be protected was felled. But the act of bad faith on the part of Forestry Tasmania and the State and Federal government did not go unnoticed. March 15th was the beginning of 10 days of action held by the Huon Valley Environment Center and Still Wild Still Threatened. In addition to actions in the forest, every day for 10 days community members stood outside the office of Lara Giddings and maintained a vigil. The 10 days rolled on into 10 weeks. We jokingly suggested announcing a “10 years of action” – but hoped it wouldn’t come down to that. The sinking feeling in our hearts reminding us that the forest doesn’t actually have 10 years left to wait. August 2011: This is where Julia’s promise comes in. After a process facilitated by government appointed Bill Kelty, which brought together the interests of all negotiating parties, an agreement was signed. This was called the Tasmanian Forest Inter-Governmental Agreement (IGA). As those who are following this blog would know by now, this was full of promise for the forest. Even stronger than a moratorium- this time there was promise of an immediate conservation agreement would be placed on the area ear-marked for protection. By this time the area had been reduced by over 140,000 hectares, though those areas not covered by the conservation agreement could still have a chance of formal protection through the verification process, if there was anything left of them by then. Still Wild Still Threatened and the Huon Valley Environment Center had serious concerns about this reduction to 430,000 hectares. In fact we took our message straight to Parliament House in Canberra, making it clear to the Prime Minister that our forests needed a better deal. A common questions asked by the media these days is something along the lines of – but shouldn’t you be willing to compromise? But you see, if they could only see the areas of forest and the areas of clearfell that I have seen then perhaps this concept of ‘compromise’ would take on a different meaning. It is those of us who spend our time traipsing about in the forest on a day to day basis who know what it really means for even a hectare to be taken off the agenda, let alone 140,000. And now, for logging to continue and we are losing more and more from the 430,00 hectares as we speak. When you live in these forests you begin to realise what it really means for that big old tree over there with the hollows in it to be felled and burnt. What it means for that Tasmanian Devil, the one with the little spot on the left side of it’s bottom, that visits the same spot every few days… you begin to realise what it really means here in the forest to compromise. And quiet frankly, the forest cannot afford anymore compromises. It has been doing so for decades. The industry has made no compromises, however… it seems they are able to continue with business as usual. in fact, they’re doing even better than business as usual. You could say they got to have their cake and eat it to. For example, Forestry was given millions of dollars of tax payers money to reschedule coupes, then they still get to log those coupes. It doesn’t take a mathematician to tally up the checks and balances and see that the it is the forest that has done all the compromising. Especially when you take into account the fact that despite this whole process, not one single hectare has been protected. So, that just about takes us up to the present. Four months passed since Julia made that announcement . And even though there were some flaws in the agreement, the least she could have done, really, is actually implement it! I couldn’t help it…. once again i got my hopes up that this was it – a conservation agreement would be announced and we could step back and take a breath. I thought of all the areas of forest that I love so much…. the Styx, Counsel, Tyenna, Upper Florentine… Soon they would be safely guarded by a conservation agreement and waiting for the day when they would be formally declared national parks and world heritage areas. Today, not one hectare is protected and logging is due to continue in over 30 coupes, including this one. You can see why it has been a tough year. And so that brings me to where I started this blog…. I wanted to write this message to all of you out there who care about this forest, especially those of you weighed down by broken promises.. don’t give up. We cannot afford to. These forests are too precious, too unique, too irreplaceable, to give up now. I know it’s hard to hold onto a sense of hope after so many let downs, but I think that there is still reason to be hopefully. I think something is beginning…. I can sense it in the emails and messages I have received this past week. A new spark seems to be emerging and now is the time, more than ever to give it the best we’ve got. Julia Gillard, Ta Ann, Forestry Tasmania, and all those responsible for the decimation of our precious natural heritage….they will know soon enough that we will not tolerate it. And that change needs to come now, before our forests are lost forever. P.S: For anyone wondering what you can do to help. Here a few small suggestions. Feel free to add more ideas in your comments…. – Post and share our introduction video like crazy on face book, email and on any other websites you can. The more people watch it the more we can get the message out there. As well as showing to the government that we have the support and interest of a large amount of people. We have reached over 1000 views now. Lets get even more – next lets aim for 10,000! – “Like” the Facebook page and get your friends to do so too. This also helps us show that we have a large amount of people supporting this campaign. – Host a community forum or a get together with people to live-chat with me. I am happy to talk to people about what is going on here, answer questions and have a chat. – Put up posters around your town, hand out flyers, hold a stall. Go to the Take Action page of our website for downloadable copies. – Write an article and get it out there – in a newsletter, local paper, magazine – any where you can. – Write to the Prime Minister. – Donate to help us keep this project running – you will find a link on the Take Action page. – Do an action in your city to highlight what is going on. Posted on December 22, 2011, in Daily Blog. Bookmark the permalink. 9 Comments. Well written Miranda! You have summarized the situation well and whilst I gather there will be some who think differently, you have given an excellent insight into the impacts of clearfell logging on the individual’s with the most to lose: the voiceless fauna and flora. Good on you for having the courage to act on their behalf. Miranda and crew you have my full support. Your tree-sit leadership in the wild and in the rain is inspirational. Your stand brings home a salutary but Thylacene portent of how unquestioned business-as-usual conveniences are shrinking Tasmania’s nature and wiping out dependent wildlife. How do you show how cumulatively destructive pressing ‘print’ is to run Ta Ann paper through a photocopier? How do you show that choosing ‘Tasie Oak’ flooring involves killing grandmother 17-storey tree like the one you’re in? The rare magic of seeing a Tigerquoll appear in a Styx Forest is priceless. How can they woodchip a Tigerquoll’s home and drive its family into extinction? Totally sickening, maybe my origional lead and brass poisoning of all politicians, one at a time wasnt too far off the truth. It is funny in Tasmania how one wing of the government can sign off on something, and another department can totally ignore the findings due to economic reasons of course!. Anyway Miranda, keep strong, and everyone else in the protection groups in Tasmania, I truely miss my time with HVEC, and my memories of Living in the Weld forests will be with me forever!. Happy Yule and New year to all! Your writing is inspiring. I hope today is lovely and sunny for you and that you do not have to watch to many trees come crashing down. International Plywood (UK) has started boycotting Ta Ann’s products. Ta Ann’s Tasmanian manager Greg Hickey claims misrepresentation, but Ta Ann is misrepresenting its PEFC Certification as it sources native old growth. HVEC’s Behind the Veneer’ report (Sep-11) confirms Ta Ann received timber from old growth coupes defined in the Regional Forest Agreement, namely: Coupe PCO17C: Picton Valley, Coupe EP031B: Esperance, Coupe FO044A: Upper Florentine Valley, Coupe TN034B: Tyenna Valley, etc. QED, crocodile tears Greg Hickey! Thank you for your inspiring effort to save our precious wild forests. Yes, broken promises can certainly wear down one’s enthusiasm for activist work, but courageous hearts like your’s Miranda keeps my heart ticking.